The most striking, in-your-face, and noticeable part of Windows 8 is its new Metro user interface, and in particular, its Start screen. The Start screen is a replacement for the Start menu that has been a feature of Windows for the last 16 years. 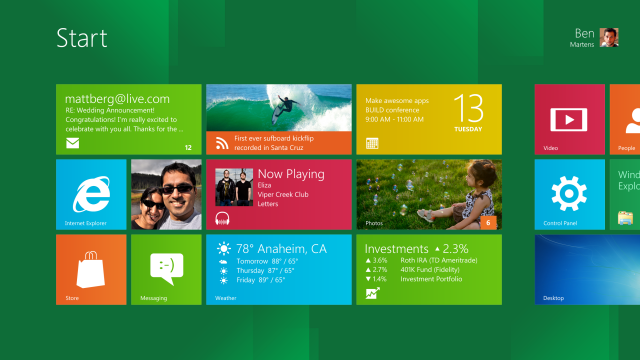 The Start screen is touch-friendly, fullscreen, and filled with live, active tiles. It couldn’t look much more different from the Start menu. Microsoft is well aware of this, and has begun tweaking the Start screen in response to user feedback. The new Start screen is definitely a big shock, and many PC users were deeply concerned that it represented a substantial step backwards. Though near-universally acknowledged as a good interface for tablet users, traditional desktop users who don’t want or need tablets worried that they were going to be forced to use something designed solely for tablet users—something that really wouldn’t work well with mice and keyboards. Different though it appears, we believe it still works more or less like the Start menu, and that even mouse and keyboard users won’t find it too different once they get over the shock of the new look. The addition of a few extra features—demonstrated by Microsoft but not in the developer preview—such as zooming out to see more icons, the ability to create named groups, and better use of the mouse wheel, would further improve the mouse and keyboard usage scenarios. Nonetheless, Microsoft has been listening to the concerns and criticisms about the Start screen raised by mouse users, and a blog post by the company describes some of the ways the criticism has been taken on board. The post is lengthy, with numerous pictures, diagrams, and even tables of data, and it’s well worth reading in full if you’re interested in some of the reasoning behind why the Start screen is built the way it is. A few points stand out as particularly significant. The “Apps” group, the catch-all collection of icons used for launching desktop applications, will be refined. In the developer preview build, this was a simple alphabetic listing, with the result that icons from different applications would be jumbled together. Now they’ll be organized into groups within the list so that all the icons from one application will be grouped together. This mirrors the Start menu’s structure. Switching to the Apps group will also be simplified; clicking the Search charm will take you there directly. The information density will also be improved. 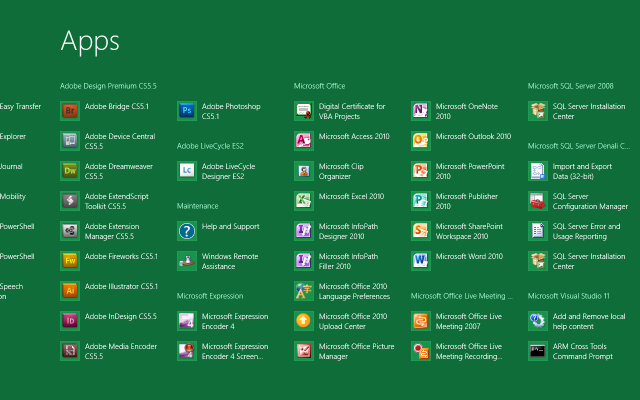 The Start screen already shows more tiles than the Start menu shows icons (by default, at least). This advantage is being further improved in two ways; high-resolution screens will gain more rows of tiles, and the Apps view icons will be packed together a little more tightly.